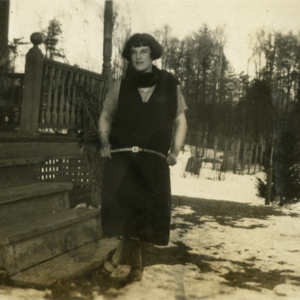 This photograph depicts Margaret Jones standing in front of the Jones' house in Kane, PA. 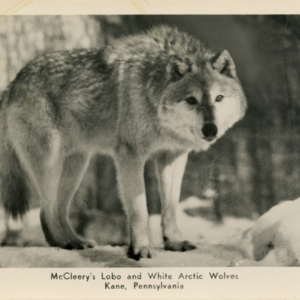 The pens of Dr. McCleery's lobo wolf park, located within the town limits of Kane, are visible in the distance. 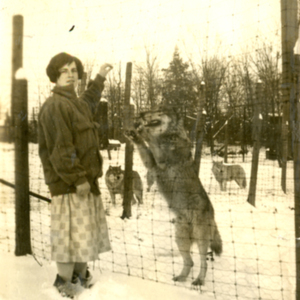 This photograph is included in the photo album of Margaret R. Jones. 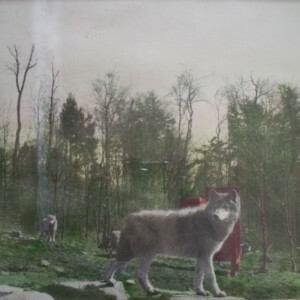 This hand-colored photograph depicts at least five wolves at Dr. McCleery's lobo wolf park, located within the town limits of Kane, PA. Two birthing boxes (painted red) are visible. 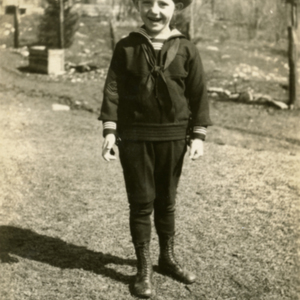 This photograph was donated to the Kane Historic Preservation Society by Audrey Towns. 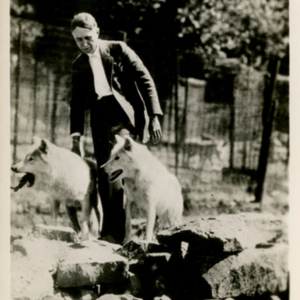 This photograph depicts Dr. McCleery standing with two of his wolves - one of which is yawning - at Dr. McCleery's lobo wolf park, located within the town limits of Kane, PA. 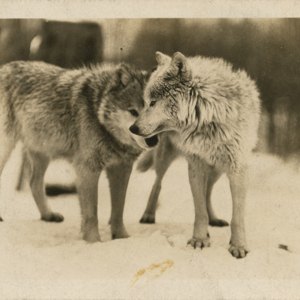 This is a divided Defender postcard. 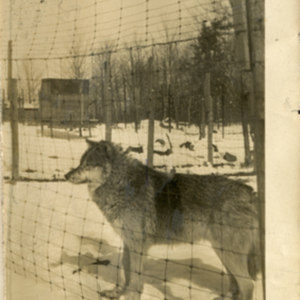 This photograph depicts a wolf at Dr. McCleery's lobo wolf park, located within the town limits of Kane, PA. 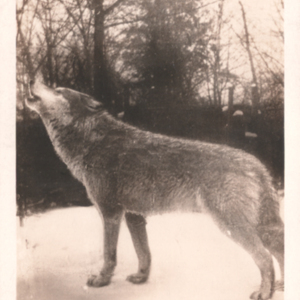 This is a postcard. 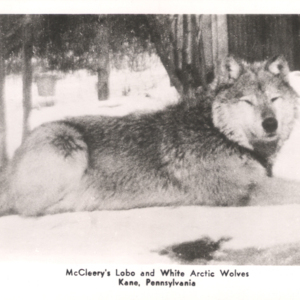 The caption on the front of the card reads, "McCleery's Lobo and White Arctic Wolves - Kane, Pennsylvania." 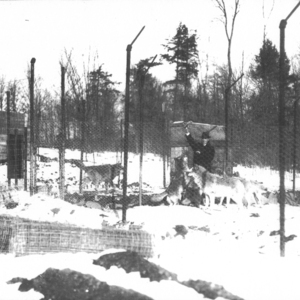 This photograph depicts Dr. McCleery feeding several wolves in a pen at Dr. McCleery's lobo wolf park, located within the town limits of Kane, PA. Two rolls of wire are on the ground outside the pens and several wooden boxes are visible. 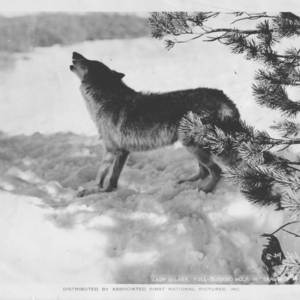 This photo is labeled "Lobo Wolves West Side." 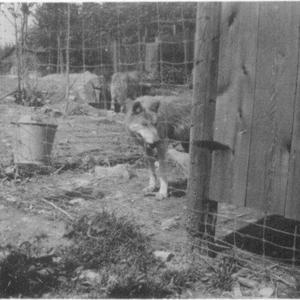 This photograph depicts a wolf in a pen near a water bucket at Dr. McCleery's lobo wolf park, located within the town limits of Kane, PA. 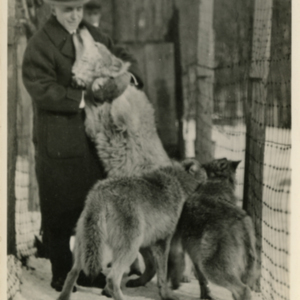 This photograph is in the same series as three other photos which are labeled "June 1924" so I assume this photo was taken at the same time. 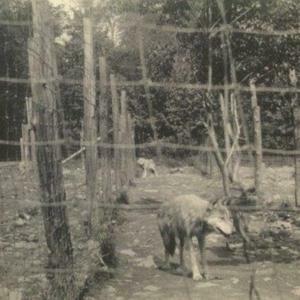 This photograph depicts two wolves in a pen at Dr. McCleery's lobo wolf park, located within the town limits of Kane, PA. "June 1924" is written on the back of this photograph. 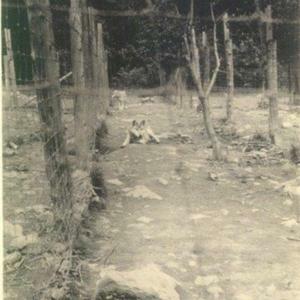 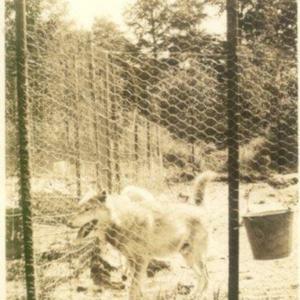 This photograph depicts a wolf in a pen near a water bucket and birthing den at Dr. McCleery's lobo wolf park, located within the town limits of Kane, PA. Another wolf is visible in a neighboring pen. 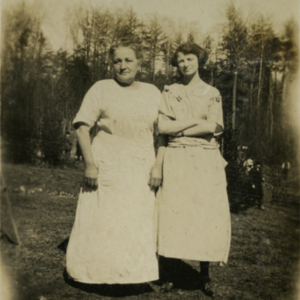 "June 1924" is written on the back of this photograph. 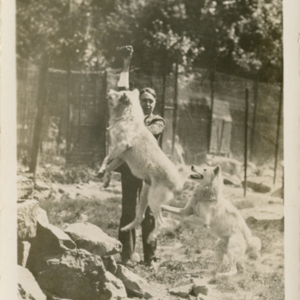 This photograph depicts Dr. McCleery petting a wolf in a pen at Dr. McCleery's lobo wolf park, located within the town limits of Kane, PA. Another wolf is visible in the pen. 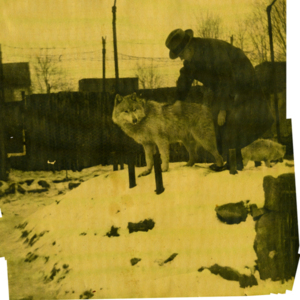 This photograph is included in the scrapbook of Earl C. Jones.